The need for photographers to give their camera added mobility, flexibility and camera security is very important. It is important for photographers to get a very good camera strap for their comfort. It is quite inadvisable for photographers to handle their camera without a strap that will effectively safeguard their camera from either being misplaced or being mishandled. Just imagine if you accidentally dropped your brand new SLR. A sturdy and good quality camera strap would be just the solution for that thousand-dollar ache. Lowepro is a leader in providing camera pouches, protective cases, backpacks and straps for imaging products. It has recently come up with new camera straps which are designed for the rugged outdoor photographer. The durability that Lowepro products all have is paramount and they will always have the quality build that is expected of a worldwide leader in their industry. When photojournalists are on the run while trying to keep up with the action that they are taking, it is very important that they will get the lightweight design that is expected of their straps. Lowepro has come out with the Speedster camera strap which has an adjustable and lightweight design which any active, on-the-go photographer will be able to use. The photographers of today are essentially more mobile than ever. They go to places where their equipment is constantly tested and they move much more quickly as each photojournalist strives to take the best and most unique photograph every time. This is a very demanding field which the Speedster camera strap from Lowepro will be able to serve quite well. The security that the strap offers is unparalleled and it provides a double ladder-lock attachment design which will ensure a very secure connection as well as a custom side-release buckle which will effectively release the camera from the strap whenever the photographer desires. This is a very useful feature as it will give the photographer more flexibility. This particular feature allows every photographer to capture superb images at any give environment without thinking about the trivial hassles of straps obstructing their grip or the viewfinder. The Speedster camera strap is the most compact and the most lightweight camera strap designed for photojournalists as well as active, on-the-go photographers. Those photographers who are very discriminating will find the simple and highly functional strap very helpful in their photographing endeavors. The strap neatly folds into camera bags and it is easily adjustable in length in order to accommodate various camera bodies as well as equipment. The quick-release buckles enable switching from one camera body to another very fast. This gives the photographer the flexibility to use various bodies during a shoot. 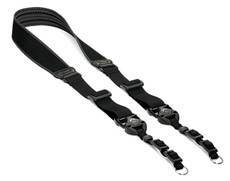 The strap also has an anti-slip rubber thread that is woven into a nylon webbing which protects clothing and prevents the Speedster strap from slipping. The very efficient design will enable photographers to do what they want to do without worrying whether their strap will give out on them.